Kumar Mangalam Birla is the Chairman of the Aditya Birla Group. The group is India's third largest business house. Major companies of Aditya Birla Group in India are Grasim, Hindalco, UltraTech Cement, Aditya Birla Nuvo and Idea Cellular. Aditya Birla Group's joint ventures include Birla Sun Life (Financial Services) and Birla NGK (Insulators). The group also has its presence in various countries such as Thailand, Indonesia, Malaysia, Philippines, Egypt, Canada, China and Australia. 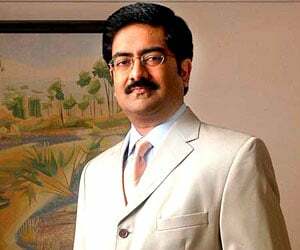 Born on June 14, 1967, Kumar Mangalam Birla spent the early of his life in Calcutta and Mumbai. He is a Chartered Accountant and did his MBA (Masters in Business Administration) from the London Business School, London. Kumar Mangalam Birla took over as Chairman in 1995, at the age of 28, after sudden demise of his father, noted industrialist Aditya Birla, after whom the group is named. When Kumar Mangalam Birla assumed the mantle at the Aditya Birla Group, Doubts were raised about his ability to handle a giant business house with interests spanning viscose, textiles and garments on the one hand and cement, aluminium and fertilisers on the other. But Kumar Mangalam proved his skeptics wrong. He brought in radical changes, changed business strategies, professionalised the entire group and replaced internal systems. Kumar Mangalam reduced his group's dependence on the cyclic commodities sectors by entering consumer products. Under Kumar Mangalam Birla's leadership, the Aditya Birla Group, apart from consolidating its position in existing businesses, also ventured into sunrise sectors like cellular telephony, asset management, software and BPO. Kumar Mangalam Birla also holds several key positions on various regulatory and professional boards, including chairmanship of the advisory committee constituted by the ministry of company affairs for 2006 and 2007, membership of the prime minister of India's advisory council on trade and industry, chairmanship of the board of trade reconstituted by the union minister of commerce and industry, and membership of the Central Board of Directors of the Reserve Bank of India. Kumar Mangalam Birla has won several honors. Major among them include The Business Leader of the Year (2003) by The Economic Times, Business Man of the Year - 2003 by Business India, and The Ernst & Young Entrepreneur of the Year - India in 2005.